Mr. F. X. Paquet was born at Quebec on the 12th of January, 1845, but most of his youth was passed at Saint-Jean-Port-Joli. In 1859, he was sent to the college at Sainte-Anne-dela-Pocati�re, where he remained six years. In 1865, he commenced to study for the Notarial profession under T. Michaud, notary public, Registrar of the County of l'Islet at St. Jean-Port-Joli. In 1869, he relinquished his notarial studies to accept an appointment as general agent and telegrapher on the Grand Trunk, the Levis and Kennebec, and the Quebec, Montreal, Ottawa and Occidental Railways, which positions he held from 1869 to 1882. Paquet commenced to collect insects in 1876, and minerals in 1880. He was appointed in 1883, by the minister of public works, as draughtsman in the chief architect's office at Ottawa, which position he now holds. The same year he was commissioned to illuminate an address, presented by the City of Ottawa to Princess Louise, on her return from Bermuda, and in 1887, he illuminated on satin the address presented by the St. Jean Baptiste Society of Ottawa to Her Majesty Queen Victoria, on attaining her Jubilee. Mr. Paquet excels in painting in water colors on satin, vellum, paper, etc., besides he has executed many original designs in pen and ink, among which are a large number of the pieces represented in this book. 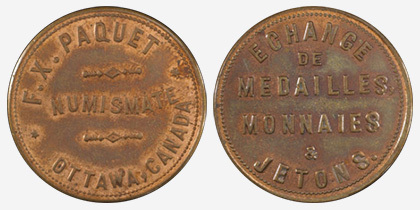 He commenced a collection of stamps in 1888 which numbered 3800 varieties, and which he sold in 1891, to confine all his leisure time to coins and medals in general, but more particularly those of Canada. He at once threw himself with ardor into the work, and by means of exchanges he soon became possessed of a considerable collection which secured several prizes and medals at the last exhibition at Ottawa, held in September. 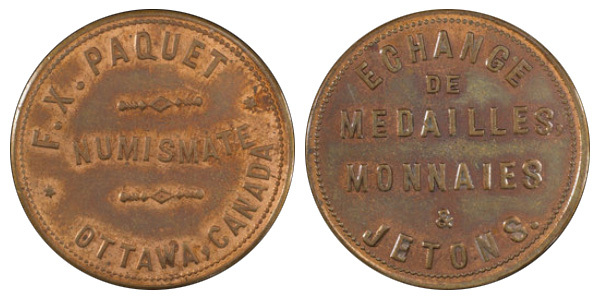 Elected Secretary of the Numismatic Society of Ottawa, in 1891, he continues to hold the position, as well as. that of Superintendent of exchanges. Engraver : The Brunswick Balke Collender Compy.